, and among the best I've come across. They contain no harmful spices like salt or pepper, no animal products, and most of the recipes are low in fat. Fat intake in a healthy diet is kept below 10 percent of calories from fat, as intakes above this amount will impair nutrient and sugar absorption as well as oxygen uptake. Many of these recipes can be prepared with nothing more than a knife, but a number contain an additional element like a blender, food processor, or spiralizer. You may want more info about ingredients and how raw food recipes combine in the stomach. Share your own mouth-watering recipes with the world here! 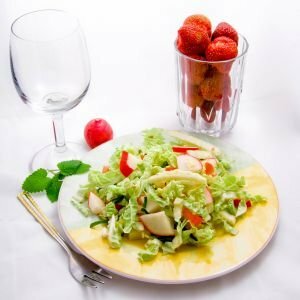 Want A Healthy But Tasty Raw Salad? Mango Salsa With Optional "Burrito"